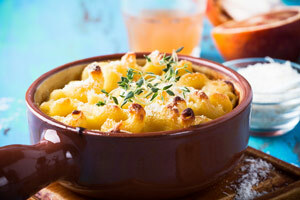 If you love cheese, and homemade mac and cheese is your ultimate comfort food, try these tips to lessen the fat. Cook the pasta in milk. This will eliminate your need for tons of butter and flour. You can also try using a stronger, more mature cheddar or using whole wheat pasta. If you are going all out and making a meat and potato dish, simply swap out the meat and potatoes with healthier versions. For example, use chicken instead of lamb, switch out potatoes for sweet potatoes and add lots of vegetables. It still gives you that delicious, homemade dinner without all of the unhealthy baggage and guilt. If your favorite comfort food is ice cream, lucky for you there are tons of healthier swaps. Try an ice cream made from non-dairy milk like coconut milk, almond milk or cashew milk. You can also make your own ice cream at home using bananas! Peel, slice and freeze a few bananas. Once they’re frozen, blend them with milk and another flavor you’d like to use. You can try vanilla, cacao powder, peanut butter or other frozen fruits. It comes out looking just like ice cream and tastes delicious! You can make healthy pancakes with simply a banana, an egg white, and cinnamon. Mash the banana, whisk in the egg white and add a dash of cinnamon, cook, and bam! Delicious and healthy pancakes for breakfast, lunch or dinner. Other simple swaps include baking or steaming instead of frying, adding applesauce to a recipe instead of eggs, oil or butter and stevia instead of sugar. Do you love comfort foods? But are you worried about the unhealthiness of comfort foods and ready to take our tips? Let us know which ones you try at home!